UNIVERSAL GENEVE TRI-COMPAX STEEL Universal Genève, "Tri-Compax." Made in the 1960s. 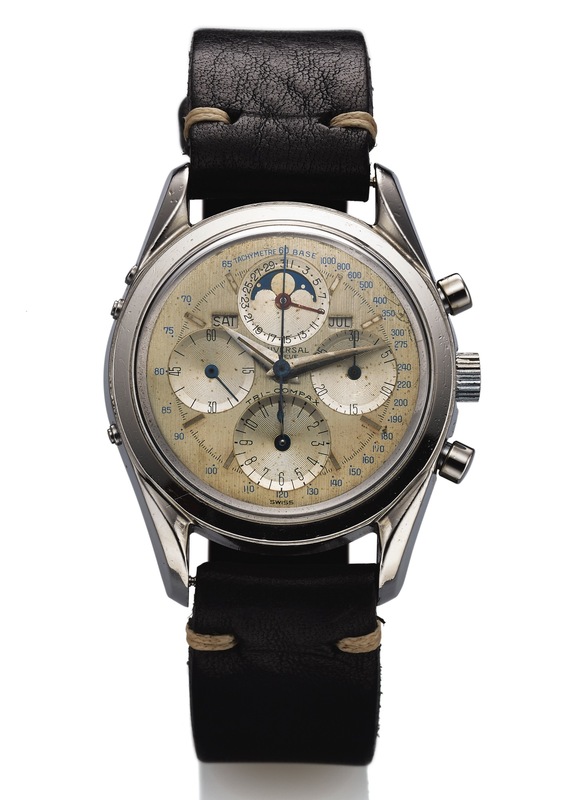 Fine, stainless steel wristwatch with round button chronograph, registers, tachometer, triple date and moon phases. Three-body, polished, lyre lugs, flat bezel, screw-down case back, correctors on the band. Brushed silver with applied steel baton indexes, outer minutes and 1/5th seconds track and blue tachometer graduation to 1000 UPH, subsidiary dials for the seconds, the 12- hour and 30-minute registers, date at 12, apertures for the days of the week, the months and the moon phases. Luminous steel dauphine hands. Cal. 287, frosted gilt, 17 jewels, straight-line lever escapement, monometallic balance, blued steel Breguet balance spring, index regulator. C. Three-body, polished, lyre lugs, flat bezel, screw-down case back, correctors on the band. D. Brushed silver with applied steel baton indexes, outer minutes and 1/5th seconds track and blue tachometer graduation to 1000 UPH, subsidiary dials for the seconds, the 12- hour and 30-minute registers, date at 12, apertures for the days of the week, the months and the moon phases. Luminous steel dauphine hands. M. Cal. 287, frosted gilt, 17 jewels, straight-line lever escapement, monometallic balance, blued steel Breguet balance spring, index regulator.